Perched on the crystalline waters of Momi Bay on Fiji's spectacular Coral Coast, this resort is the ultimate island retreat. Spacious and beautifully appointed accommodations offer beautiful views of the gardens, lagoon and ocean. 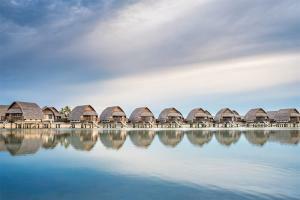 For a truly magical experience, upgrade to an overwater villa. The hotel features an array of luxury facilities, including a jaw-dropping infinity pool with a swim-up bar, three restaurants and the tranquil Quan Spa. Begin your day with breakfast at Goji Kitchen and Bar, then sip on poolside cocktails, and wind down with a sunset dinner at the Fish Bar. The resort is located approximately 23 miles (a 45-minute drive) from Nadi International airport.